Get started quickly with AWS using the AWS SDK for C++. The SDK is a modern, open-source C++ library that makes it easy to integrate your C++ application with AWS services like Amazon S3, Amazon Kinesis, and Amazon DynamoDB. Regularly built and tested on a variety of platforms including Windows, Linux, Mac, Android, and iOS. Designed to work with CMake so that users can easily compile and link against the SDK, without the need to know about the SDK's dependency details. To find out more, see this blog post. Plug in your own memory managers to customize how memory is allocated and deallocated. To learn more, see our user guide. Supports all public AWS services and is updated frequently to support the latest API changes. 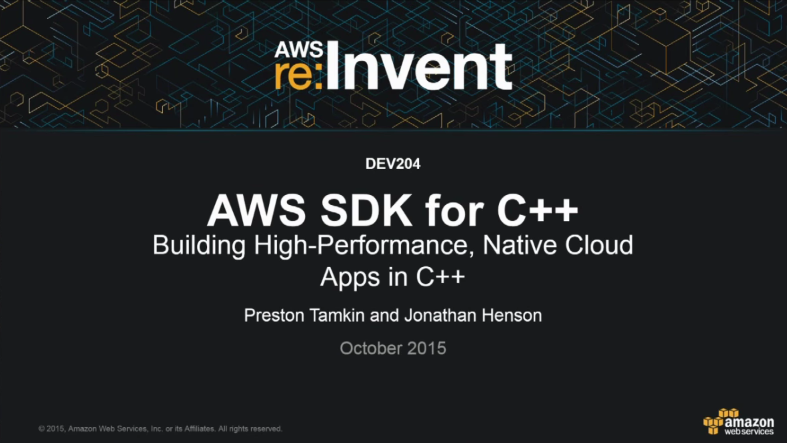 This presentation delivered at AWS re:Invent 2015 introduces the AWS SDK for C++ and demonstrates various features of the SDK with code samples.